Insulated roller shutters ensure good thermal insulation and reduced noise from both the inside and outside. All of these shutters are available with a safety sensor which recognises obstructions and stops the door as a precaution. This reliably avoids injuries and damage to property. 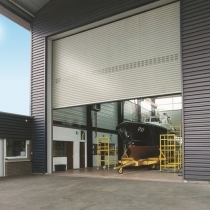 > Hormann SB roller shutters have tension spring assembly allowing them to be easily to opened and closed manually or if electric, door travel is gentle on the operator. This type of shutter is available with the Decotherm profile up to 4000 mm x 4000 mm. 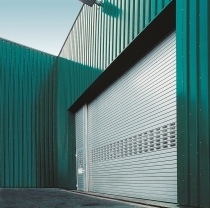 > Hormann Basic roller shutters have a compact, robust design made from galvanised steel. This type of shutter is available with the Decotherm profile up to 5000 mm x 4500mm. > Hormann Classic roller shutters have a stable design made from galvanised steel with additional features to ensure quieter operation, prevent penetration of dirt and rain and withstand extreme wind loads. This type of shutter is available with the Decotherm profile up to 10000 mm x 9000mm or the HR 116 A profile up to 11750 mm x 8000 mm. 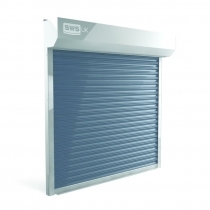 SWS have now also launched an electrically operated insulated steel industrial roller shutter, the SeceuroDoor | 95. It has a special "full hard" profile which is resistant to damage and reduces deflection. Please see below for further details or contact us for more information.